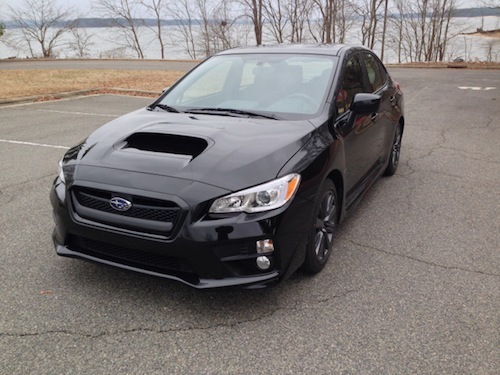 The Subaru WRX is a compact sports sedan built on the platform that underpins the Impreza. Through 2014 it was officially known as the Impreza WRX, but beginning with the spring 2014 release of the all-new 2015 model, the WRX becomes a model line all of its own. Subie dooby-doo — woo hoo! The Impreza-WRX separation comes as competition in the segment heats up. The Dodge Dart is the most recent entry, following on the heels of the Mazda3, Mitsubishi Lancer, Honda Civic, and the Ford Focus, each offering performance editions to battle the WRX. The new Subaru WRX, however, may have found a leg up with its fresh look, a new engine, and its first ever 6-speed manual transmission. Neither ice nor mud nor even a torrential downpour could keep me from putting this performance model through its week-long paces, helping this driver to discover its attributes while also gaining an appreciation for the rabid enthusiasm that its devotees have for the little Subie. The Subaru’s arrival coincided with the monthly Cars and Coffee meet up in my area that I have been attending of late. Sinus infection notwithstanding, I took a hot shower and headed down to Waverly Place in Cary, NC, to gauge interest in the new model. As I pulled up, a handful of guys standing in front of a small collection of late model WRXs gawked, perhaps not believing what they were seeing with their own eyes: the very model they longed to behold. 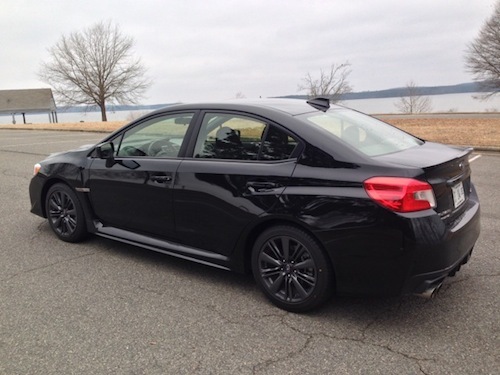 Space was made for the graphite black sedan and a star was born — not me, the Subaru WRX. For the next 90 minutes I met more than five dozen people who came to admire the sedan and were invited to take pictures, get inside, and look around. Troy, Chris, Eric, and Dave were among the guys who seemed fascinated that the “real deal” was present and also shared with me their passion and knowledge of all things WRX. 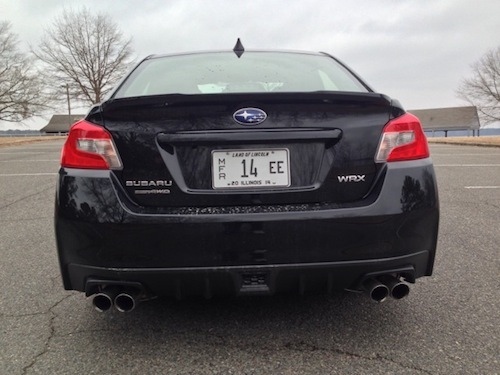 And that was a good thing too: I’ve driven other Subarus, but it was my first experience with the WRX. So, I was a student and learned much about it in advance of my extended drive time with the not-yet-released model. Fittingly, the demonstration model was equipped with the engine-transmission combination that most enthusiasts wanted to see, namely a twin-scroll turbocharged 2.0-liter four cylinder boxer engine paired with its first-ever six-speed manual transmission. I learned that the lack of a sixth gear had been the biggest complaint about the WRX, something Subaru wisely resolved with the new model. And the spring-arriving model now has Subaru’s newest engine: a 2.0-liter horizontally-opposed four cylinder, the same engine used in the BRZ. Where the BRZ’s engine is normally aspirated, this one is turbocharged, same as before. Dropping displacement from 2.5 to 2.0 liters has not resulted in a loss of performance, however. The new model is rated at 268 horsepower at 5,600 rpm versus the 265 horsepower at 6,000 rpm for the previous model. Torque now comes in at 258 foot-pounds versus the previous 244 rating. Importantly, the torque curve starts low and lasts long: 2,000 to 5,200 rpm. And here is another noteworthy fact: in the WRX, Subaru went with its own direct-injection setup instead of the direct- and port-injection arrangement found in the BRZ and also used in the Scion FR-S. So there is no Toyota connection with the new model — Subaru’s parts bin supplied it all. The six-speed manual transmission will please WRX fans to no end. It isn’t the only transmission, but it likely will be the most desired one. 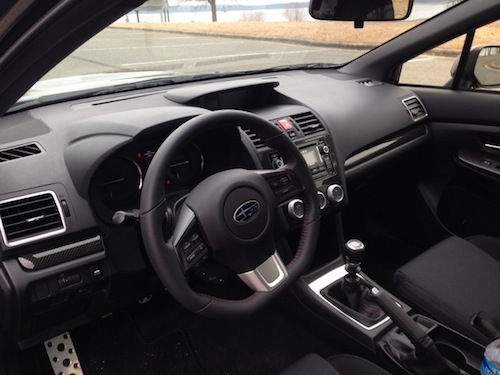 Even so, Subaru offers its Lineartronic continuously variable transmission with manual shifting capabilities, enabling the driver to mimic both six- (Sport mode) and eight-speed (Sport+) gear (or step) shifts with the steering wheel paddle switches. Honestly, if you are passionate about the WRX then anything other than the manual transmission diminishes the experience in my opinion. One matter that has disappointed some WRX fans is that as of 2015, only a sedan will be made. Gone is the hatchback, a bitter loss for one group. That decision has surprised some given that the take rate has been evenly divided between the two models. However, Subaru’s financial resources are no where as deep as it big competitors, thus going with the sedan allows the company to concentrate on making other costly improvements especially in performance and handling. Subaru calls the WRX a “bold new wide-body design” with its stiffer chassis, larger interior, and new design elements. The new model has a bolder front design marked by a unique grille and a deep front spoiler. Take note of the “nose cone” design, what blends the grille and bumper cap into one unit in front of the hood. Yes, the hood is now made of aluminum and features a functional hood scoop, drawing fresh air to the intercooler. It sits lower too in a bid to enhance driver visibility. Subaru is also quick to point out that the hood, front fenders, doors and quarters, bumpers, head lamps and tail light clusters are exclusive to the WRX. These features join other performance-look embellishments including vertical front fender vents with a mesh screen and bright adornment, side sill spoilers, and rear touches that include LED tail lights, a diffuser and an available lip spoiler. Not a few Cars and Coffee camera-toting enthusiasts were seen observing the skirting and the other changes apparent with the 2015 edition. As much as the exterior caught the attention of the crowd, it was the changes to the interior that also brought out its share of admirers. 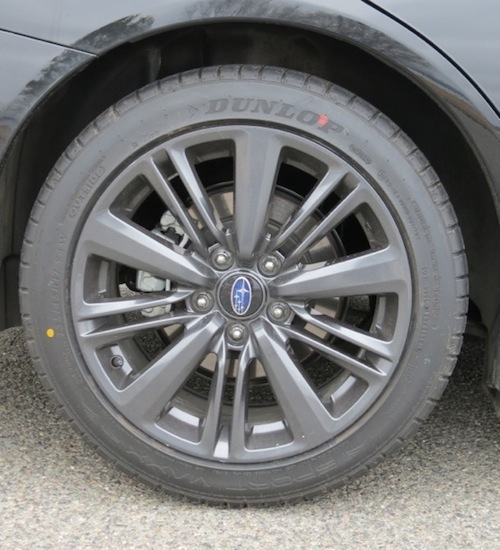 Subaru squeezed out more cabin room by adding one inch to the wheelbase and by pushing the base of the A-pillars (front pillars) forward by eight inches to improve visibility and to gain a more aerodynamic flow. Door openings were widened and side sills lowered to make it easier to get in and out, what is especially welcome in the back seat where two can sit comfortably and three can be stuffed in. 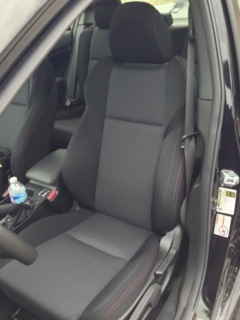 Up front, the seats are sufficiently bolstered and now come with a two-way heating element: hot and hotter still. It is almost a given today that a heating feature is included or available, and in the Subaru WRX it does the job by sending heat across the sides and up the lower back. 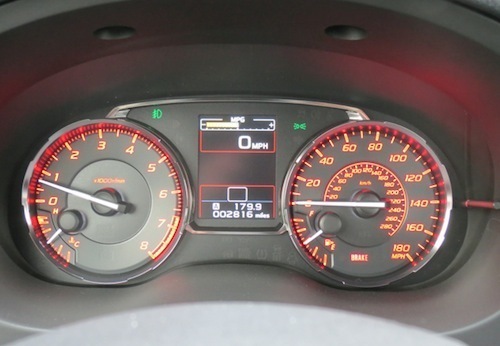 The instrument panel features a two-gauge layout flanking a 3.5-inch driver information center screen. A 4.3-inch LCD screen displays a variety of vehicle functions including a rear view camera, audio, and climate settings. And fan boys and girls alike will be drawn to the boost gauge display, one “toy” I would have loved to played with if I had more time with the vehicle. Alas, I spent all my time acquainting myself with the WRX’s performance and handling features, discovering the joys long familiar to Subie faithful. As good as the Subie looks at a car show and tell, nothing compares to taking it on the road. What the WRX fans said about the compact sports sedan prepared me for what was coming down as I put the compact cruiser through its paces. Off the line, the Subaru WRX offers very good power, taking this four-door beast to 60 mph in just over five seconds. Where it shines on the road is everywhere, especially between second and fifth gears where the torque curve can be most appreciated. I absolutely enjoyed pressing down on the gas pedal and getting a confident pick-me-up that allowed me pass with authority or handle every twist and turn of the road with confidence. And the handling is superb, now enhanced by active torque vectoring that sends braking to the inside front wheel as you push into turns or perform your favorite loops. It is always engaged when operating in “normal” and “traction” modes, but it along with stability and traction control can be shut off for an even more inspired drive. For me, that meant taking the Subie too my favorite wide open parking area and shutting off the system. Keeping the transmission in second gear I pressed the pedal and went through my usual drifting routine. The WRX responded with super-quick steering as I put it through the paces, an experience enhanced through its 50:50 front to rear torque distribution. And as the C&C guys affirmed, the WRX does not disappoint in all matters handling. Once again joining the standard model is the high-performance WRX STI, a model equipped with a turbocharged 2.5-liter four cylinder engine. This one maintains the 305-horsepower and 290 foot-pounds of torque of the previous generation model and includes a driver control center differential with six locking levels. Woo hoo! It is doubtful that Subaru will have much difficulty selling the WRX. Pricing has yet to be announced, but with its official separation from the WRX line, you’re likely to find at least a slight increase across the board for a model that is set to dominate the competition and win new converts. EPA: 21 mpg city, 28 mpg hwy.